These are all the notes I could manage to take while still paying sufficent attention. It should go without saying that weirdnesses or cracks that appear are no doubt due to my memory, hand writing, or stupidity and not to Reza! Edit: Reza has posted his notes for the first half here. Reza set up the talk as addressing “Genuine inhumanism” as an encounter with modern thought thereby entailing a dis-enthralled system of knowledge. He set out to do this through a series of thought pieces. These pieces began with an outline of the ambitions of post-Copernican thought to then be followed by a tripartite critique or assault against three conceptualizations of assault (and to propose a more epistemological model of acceleration as a counter). 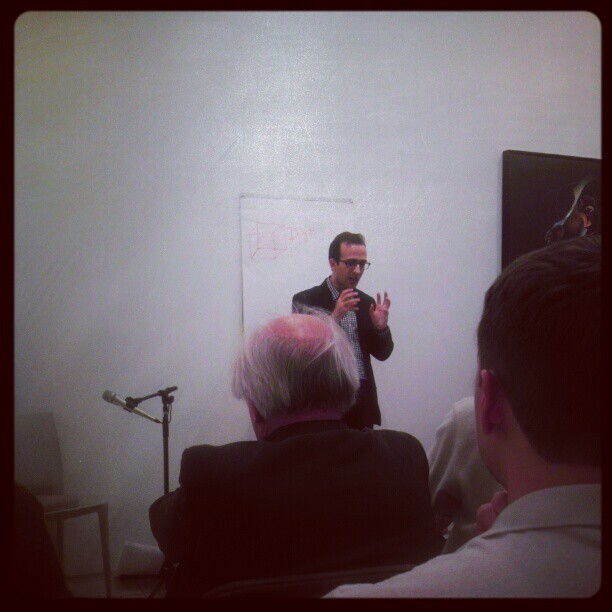 At the same time Reza noted the upswing of the various forms of acceleration he was critiquing. In proper asymptotic fashion, Reza argued that the charge of Nick Land’s conceptualization was that the ends of reason do not lead to more reason, but simply unfold the unreasonable. 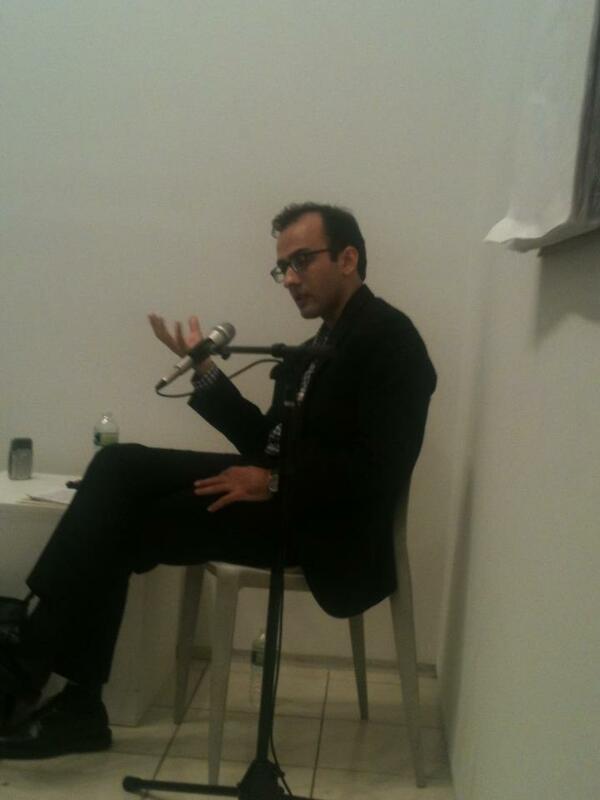 Secondly, while Reza seemed to acknowledge the critical/epistemological knife of Brandom and Brassier, he set out their project as ‘axiomatic deaccelerationists’ Thirdly, Reza asked how acceleration could be understood as epistemological mediation which engenders, and is engendered by, germs of modern knowledge. Lastly, Reza proposed a diagrammatic example of modern acceleration as a form of epistemological navigation following the lead of Oresme. Following this general map Reza began to discuss the ramifications of Modern Systems of Knowledge as he saw them. Structural, knowledge is oblique as it always works from the local to the global and functions in an asymptotic manner (ie the transcendental local can only function asymptotically). Because of this topological constraint [as opposed to something like correlationism?] knowledge can only access objects via the concept of space and therefore one must understand the topoi of thought. In the service of such topological thinking the computational relation between information and knowledge (in the form of computational or iterative myth) must be debunked). This in turn is forced by the 11th commandment – as long as there is a possible path, it is mandatory to take it. Modern knowledge is a thrall to space. This enthrallment worms its way into the question ‘what is the concept?’ The question becomes how is the concept an information space that can be integrated into the apparently non-informational [the physical, structural, etc?] 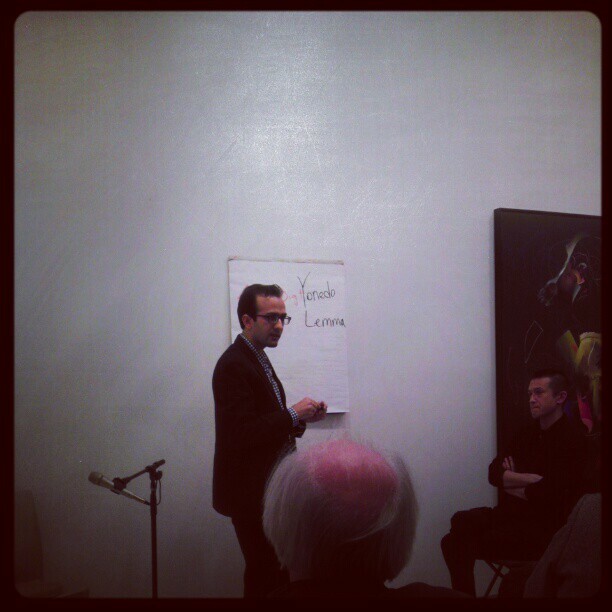 Here Reza entered into a discussion of Longo’s gestural thinking. [As I am just getting into Longo I cant really do this justice] Gestural thinking works in detecting symmetries as concepts are produced by normativity as geometrical gestures. Because of the importance of the topological for the conceptual, mathematics become the science of the concept since math transfers the invariances as the gesture that has maximal gestural stability. The space of the concept can be thought of in terms of the shell that the snail carries on its own back ie concepts are no longer discrete but are mobile (concepts are the topos of the concept). How does one then locate the concept if it is constantly shifting like a metamorphic protean god? Computational dynamics sees this as the problem as repeated localization whereas it is actually ramifications of the locality of the concept that pushes it into the open. Here Reza mentioned the Bourne Identity as linking together the where I am with the who I’m I [brings up a tactical vision of the snail] Each question is a new plot line moving through ramified concepts. This engenders a anti-Heideggerian move, roots are always mobile. Following such a model of navigation the transcendental procedure is taken to the extreme as asymptotic due to the structure of the object and the structure becomes restructured asymptotically through the operations of the concept. Reza then reiterated the agenda of his tripartite critique in which all the targets are guilty of deep access whether machinic (Land), normative (Brassier), political (Marxism). Land’s accelerationism functions programatically and not epistemologically working towards the Machinic Singularity via the computational regime. Computational dynamics hinge on algorithmic processes whose iterative nature explains its efficacy. Iteration only functions in finite time and hence the speed of acceleration. Against this Reza discussed Poincare’s critique of the contingency of the iterative loop apparent in high frequency trade and the failure of battlespace virtualization. The iterative medium cannot handle contingency but only the pseudo-randomness of Laplace and Hilbert. This pseudo-randomness is bound to Frege’s absolute logocentric formalism and the confines of Hilbert space. Hilbert believed that the world could be broken down into data-cubes. For Hilbert small perturbations were unimportant and interations lead to an increase in precision and therefore the consequences of iteration are meta-predictable. Such thinking should be combated as participating in the metaphysics of necessity. One should utilize infinite contingency against predictability. Turing and Hilbert see the algorithmic process as deterritorializing the entire planet. Small perturbations are infinite and finite and have real consequences down the line. One should strive for coherency over consistency (which is too normative in the end). The physical world is one of geodesic principles and the straightforward use of information is lost as one must take into account entanglement. Furthermore, the machine algorithm has no place for ignorance. Laws are not a priori given in physical space – they are the result of the observer working within geodesic space. The rational unfolds the unreasonable. Algorithmic thought on the other hand can only answer ‘yes or no’ as its ‘ignorance’ is already axiomatically decided. Algorithmic thinking thereby collapse falsifiability and ignorance. The machinic becomes purely strategic and ideological. Reza then turned to Brassier and Brandom. The normative turn of certain Sellarsians suffers from an inference problem since norms are by definition recursive and therefore always yield the same result. In this sense normativity is a mode of iteration. Against normativity acceleration should be followed as the catastrophic rearrangement of the limits of the system. Peirce pushes normative though a synthesis of thinking and doing and not a metaphysical enactivism but a form of gesture as a form of action (in the same way as Bertholz). These gestures stem from viewing reason (via Chatelet) as a ration of thought to nature. Reason is the broadening of the scope of oscillation between nature and culture in a rational to and fro-ing. Broader forms of reasoning are required. Abductive reasoning or manipulative epistemology are good mental labs for developing extreme hypotheses. We should embrace violent noetic propulsions which are mutilating as non-neutral observers are imported into fuzzy zones. Observers are forced to work in a disequilibrial dynamics or twisted contingency but a rational disequilibrium introducing new forms into space. Acceleration responds to the global scope of knowledge – concepts need to be released out into the open (the catastrophes and disasters of Rene Thom) demanding the subject to improvise into contingency. Acceleration functions as the epistemic navigation of the concept space introducing dialectical instability. Chatelet’s dialectics are a form of alien communication, they are a form of imperfect cutting or dialectical severance as an insider is left in what is cut off leading to a new ratio or intermix of thought and nature. The accelerationist gesture creates cognitive attractors which attracts ignorance as mitigation. Acceleration functions as a means of thinking catastrophes in order to establish a new accessibility. Truth is co-constituitve with error, truth is non-conceptual whereas for Brassier action produces pragmatics with a prestablished relation to nature. An alternative model is that of the long forgotten practice of metis or cunning reason against the regime of simulation as seen in the work of Benedict Singleton. Another promising avenue is the anarchic constructivism of Gabriel Catren in which the thinker or navigator is the gluing together of the rebel and the foundationalist. We should pursue metisocratic reason towards the unreasonable and engage in an ethics of humiliation. Is there any concern more pressing today than thinking what it means to have in common? From debates on biotechnology and shared gene pools, to the relation between the digital commons and public culture, to political and theological genealogies of the common and community, to the fraying European Community, one of the most decisive questions for contemporary life concerns what having and being in common entails. Why? When did the common become a question and not a declaration? The reasons are many. Certainly, the Fall of the Berlin Wall discredited the account Communism had provided of the common. A number of works written in the wake of Communism’s collapse also helped open the common to philosophical investigation: works from Giorgio Agamben, Maurice Blanchot, Jacques Derrida, Jean-Luc Nancy, and Roberto Esposito, among others. One effect of their readings was to have made clearer the profound influence a certain language of sovereignty and the law enjoys over how we understand collective life. Where the common and community are concepts, “commonalities” captures the dynamism of the relations that make up both; the relation of the common not only to subjects and individuals but to other living entities as well as objects. Where perspectives on the common and community are largely indebted to what has been called “political theology,” the perspective provided by “commonalities” is political in the sense that it concerns itself primarily with emerging forms of being together and having together. Not surprisingly, in “commonalities” communication moves to the center but not the protected and ultimately unsatisfying communication that so dominates interactions today. Rather communication among “commonalities” resembles a contamination of approaches and perspectives that leads to new modes of being. Where before there was always and only the common and its privileged form, the community, now a horizon for thought becomes available that is capable of accounting for immanent (and possibly common) singularities. “Commonalities” names a research project in which the common becomes a mode of investigating and writing the political: a way of creating collectively that discloses the immanent singularities that characterize the contemporary moment. The series Commonalities registers such a moment for thinking the political across the common. Featuring works that take up the question and the promise of the common ecumenically, Commonalities is not limited to any one philosophical tradition. Rather it spotlights the forms that the common assumes in a number of disciplines and traditions: in greater attention to the importance of relationality and interdependence; in bio-political research; and in ongoing critiques of all forms of the common thought merely as instances of political theology. In a word the series is addressed to those interested in imagining possible worlds held in common. A series of SR and SR related events will be taking place mid September in NYC. Graham has posted about these here. I believe Eileen Joy is also speaking on this date @ TPSNY on SR and Literature. 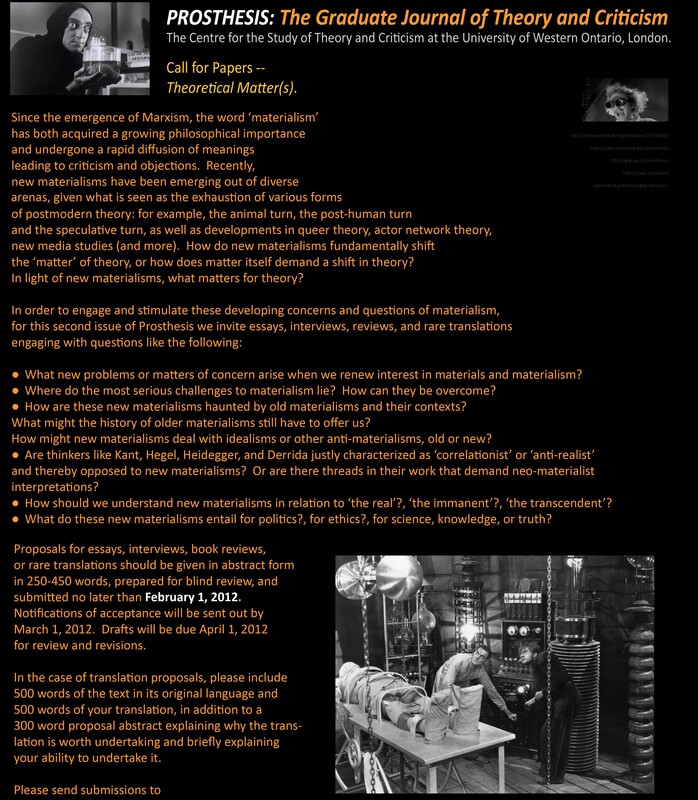 I’ll be presenting on Cyclonopedia, Lovecraft, and some other geophilosophical weirdness. Please comment if there are other events going on or if you have further details, links, etc. The first issue of Thinking Nature is available here. 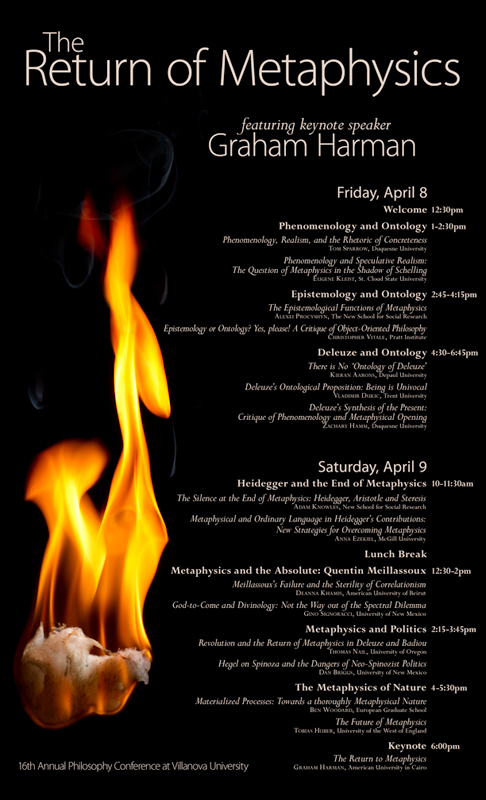 Here is the poster and schedule for the upcoming Return of Metaphysics conference at Villanova. Should be an interesting event. Eileen Joy has posted the audiofiles for the Speculative Medievalisms event here. Click on the appropriate talk titles to listen. A second Speculative Medievalisms event will take place on September 16 in NYC. Information regarding this is at the above link as well.